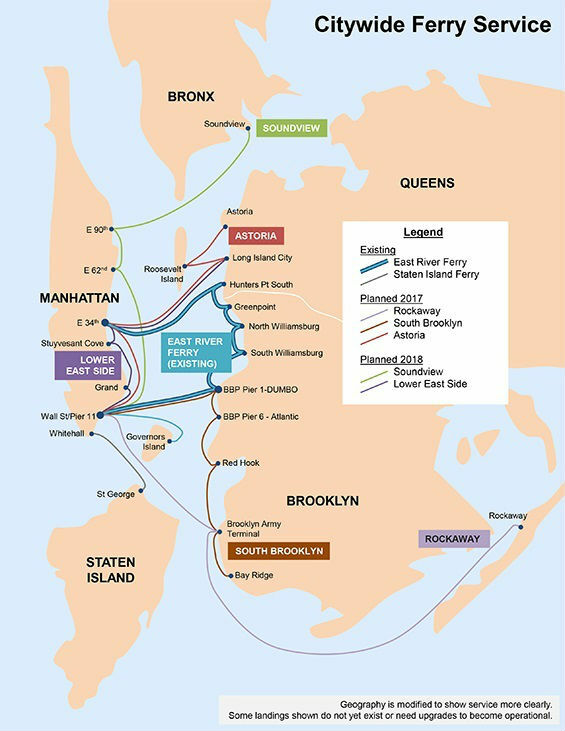 With the Citywide Ferry Service on track to launch next summer, city officials announced last week that a new ferry landing will arrive in Long Island City as part of the first phase of expansion seeking to better connect outer borough residents to Manhattan. Metal Shark and Horizon shipyards have been contracted to build the ferries in Louisiana and Alabama, and they will be operated by Hornblower Inc., a California-based water transit company that’s been operating in New York harbor for nearly 10 years. The initiative was announced early in 2015, spearheaded by New York Economic Development Corporation (NYEDC) and the city government. Next summer’s expansion will include three new routes, known as the Astoria route, the Rockaway route, and the South Brooklyn route. The Astoria route will connect to Astoria, Roosevelt Island, Long Island City, East 34th Street and Wall Street; the Rockaway route will connect to the Brooklyn Army Terminal and Wall Street; the South Brooklyn route will connect Bay Ridge, Brooklyn Army Terminal, Red Hook, Brooklyn Bridge’s Pier 1 and Pier 6, and Wall Street, with an optional connection to Governor’s Island. In the following year, ferry service will be expanded into the Bronx, with additional landings to be offered on the Lower East Side. The Citywide Ferry Service will carry an estimated 4.6 million passenger trips per year when it is fully operational in 2018. Additional upgrades for Staten Island are currently part of a third, yet-to-be-funded phase of expansion, connecting Coney Island, Stapleton, and lower Manhattan. Each of the new boats will be 85-feet-long, offer free wi-fi, heated decks, and the capacity to carry 150 passengers, with additional room for bicycles, strollers, and wheelchairs. Although Hornblower will charge $2.75 for a one-way ride—the same cost of a subway ride—integration with subway payment systems will be delayed several years, given that the MTA is in the early stages of replacing the MetroCard with new payment technologies, as reported in AM New York. Hornblower has been in New York City since 2007 as the only mode of transportation to Ellis Island and Liberty Island, but the Citywide Ferry Service will be its first commuter operation. 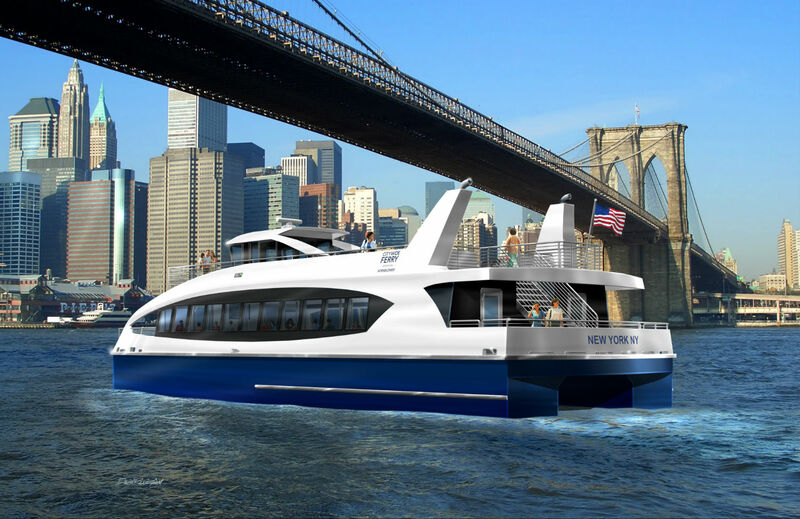 It will compete directly with New York Water Taxi, which boasts a fleet of 12 vessels, and has operated for 15 years. “The City is creating a government-subsidized monopoly that will force us out of business, stifle competition, and have tremendous leverage against the City in any future negotiations,” New York Water Taxi executive vice president Peter Ebright told Gothamist back in March. New York Economic Development Corporation (NYEDC) president Maria Torres-Springer responded to the threats by proposing that the city would work to help displaced workers find new jobs in the expanded Citywide Ferry Service network in the event that NYWT goes out of business.